During his trip there, Trump was joined aboard Air Force One by Defense Secretary Jim Mattis. NEWPORT NEWS: Embracing a stronger defense, President Donald Trump is meeting with sailors and shipbuilders on an aircraft carrier in Virginia as he promotes his plans for a major military buildup. Trump traveled Thursday to Newport News to deliver a speech aboard the Gerald R. Ford, a $12.9 billion warship that is expected to be commissioned this year after cost overruns and delays. Wearing a red USA cap, Trump saluted sailors as he arrived on the carrier. A draft budget plan released earlier this week by the White House would add $54 billion to the Pentagon's projected budget, a 10 percent increase. 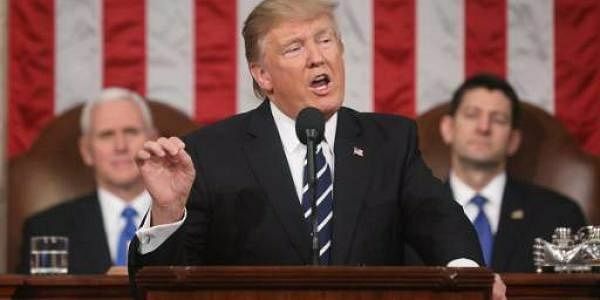 "To keep America safe, we must provide the men and women of the United States military with the tools they need to prevent war," Trump said in his address to Congress on Tuesday night. Trump, in his 2016 campaign, repeatedly pledged to rebuild what he called the nation's "depleted" military and told supporters at Regent University in Virginia Beach in October that the region's naval installations would be "right at the center of the action with the building of new ships." The PCU Gerald R. Ford CVN 78, located at Newport News Shipbuilding, will be the first of the Navy's next generation of aircraft carriers and is expected to accommodate some 2,600 sailors. Trump's speech to a joint session of Congress, his first as president, included his past calls for repealing the "defense sequester," or across-the-board budget cuts instituted by Congress. He will need the repeal to achieve the kinds of increased defense spending that he is seeking.